My goals in this article have been to describe two types of multiple-Wh-fronting languages and to integrate them into a general typology of Wh-movement and multiple-Wh-constructions. In the first part of the article I demonstrated that in spite of their superficial similarity, the East European languages which normally place all Wh-words at the beginning of the clause fall into two distinct groups with different structures for multiple-Wh-constructions. One group, which includes Bulgarian and Romanian, places all of the Wh-words of a multiple question in SpecCP at S-structure, while the second group, including Polish, Czech, and Serbo-Croatian, has only one Wh-word in SpecCP. I have referred to these two groups as the [+MFS] (Multiply Filled Specifier) and [−MFS] languages, respectively. The difference in S-structure accounts for systematic differences in extraction possibilities for multiple Wh-words, island effects, clitic position and occurrence of parentheticals and other material within the fronted Wh-word sequence, and strictness of word order in multiple-Wh-constructions in the two types of languages. 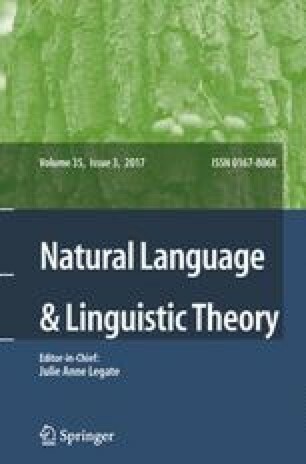 The second part of the article attempts to locate the two types of multiple-Wh-fronting languages within the broader range of possible structures for multiple questions and to provide some account of this range. As a preliminary to this discussion, the two multiple-fronting structures are spelled out in more detail. For the [+MFS] languages I argue for a hierarchical structure within SpecCP, such that noninitial WHs are adjoined to the right of the specifier position, while the initial one is the head of SpecCP. For the [−MFS] languages, I argue for a structure in which each noninitial WH is adjoined to IP. Among other advantages, these structures make it possible to bring the word order differences between the two types of languages under a version of the split ECP, specifically a requirement that Wh-traces be locally bound at LF. Sections 2.4 and 2.5 present several factors which, taken together, account for much of the crosslinguistic variation in Wh-constructions. One of these, the Condition of SpecCP Adjunction, holds that languages differ in the levels at which they permit adjunction to SpecCP. Other factors considered are the level(s) at which Wh-movement applies, whether Comp can be intrinsically [+WH], and whether LF Wh-movement is from A or A' positions. Further work may well show some of these to be derivable from more basic parameters. In closing, I would like to touch briefly on the important issue of learnability. How does a child learning a multiple-Wh-fronting language come to know whether it is a [+MFS] or a [−MFS] language? More generally, how does any child know where its language fits in the range of types available for Wh-constructions, particularly multiple questions? Following Adams (1984), I assume that the unmarked value for the CSA is that it applies at all levels. The child thus needs positive evidence in the form of multiple-Wh-questions to conclude that a language allows adjunction to SpecCP at LF, and in the form of Wh-island violations or multiple extraction to conclude that it does so at S-structure. Evidence for SpecCP adjunction at PF could include multiple Wh-phrases preceding a complementizer, or perhaps second position clitics following multiple WHs, if cliticization is sensitive to PF. Without such evidence at each level, the language learner assumes adjunction to SpecCP is impossible. This part of the system is thus definitely learnable, and a child presented with evidence for SpecCP adjunction at all three levels would have all the information necessary to know he or she was learning a [+MFS] language. Similarly, positive evidence is available for the level at which Wh-movement operates. In the absence of overtly moved Wh-phrases the learner assumes no syntactic Wh-movement. In the absence of WH in situ the learner assumes no LF Wh-movement from A positions. And in the absence of a [−MFS] pattern (see below) the learner assumes no LF movement from A' positions. If both moved and in situ or [−MFS] pattern Wh-phrases are found, the learner concludes that Wh-movement applies at both levels. By a [−MFS] pattern I mean multiple Wh-fronting with no subject/object word order asymmetry, second position clitics and parentheticals following the first Wh-word, and no multiple extraction. Any evidence from clitics would be especially useful for a learner, since clitics are found in short, high-frequency sentence types. This [−MFS] pattern allows the child to conclude that he or she is learning a language with LF movement from A' positions, i.e. a [−MFS] language. Early versions of most of the material in this article were presented at the LSA 1985 and 1986 annual meetings, the Fifth Balkan and South Slavic Meeting, and the Harvard Linguistic Circle. I would like to thank Dimitrije Stafanović, Ljuba Gribble, Rodică Boţoman, Rada Hanu, Vesna Radanović, Steven Franks, Eva Eckert, Donka Farkas, Donca Steriade, Milan Panić and several NLLT referees for helping with data and/or commenting on earlier drafts, and the University of Illinois Russian and East European Center for its support.